Another year gone by, and what a year. Life is looking so much better then exactly a year ago. My work environment is a thousand times better, that first book is out and to make all that look unimportant I've got a beautiful daughter. 19 Years ago I had almost finished living in Oklahoma City for a year with the most wonderful host family. I lost touch with them a long time ago (and their names are ungooglable) but last week I think I might have found them. That started with me scanning old negatives, notable this one. The couple on this photo are good friends of them and I remembered their names and googled them, and found them and that's where I am now. Oh yeah, and they like hunting deer, with a bow and arrow. 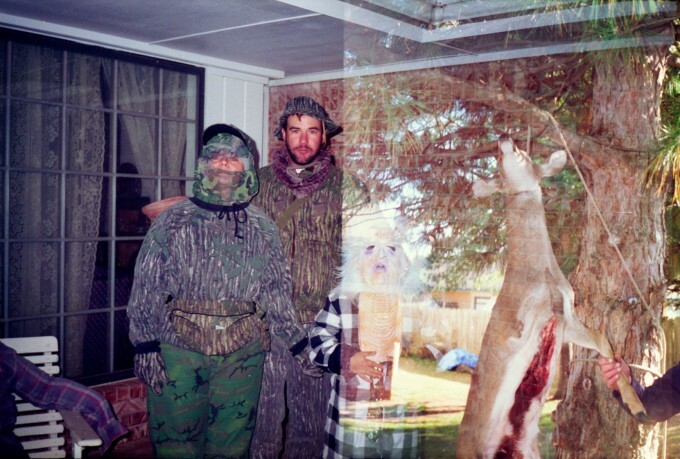 Funny enough the halloween image got double exposed with the deer image, in-camera. By accident?